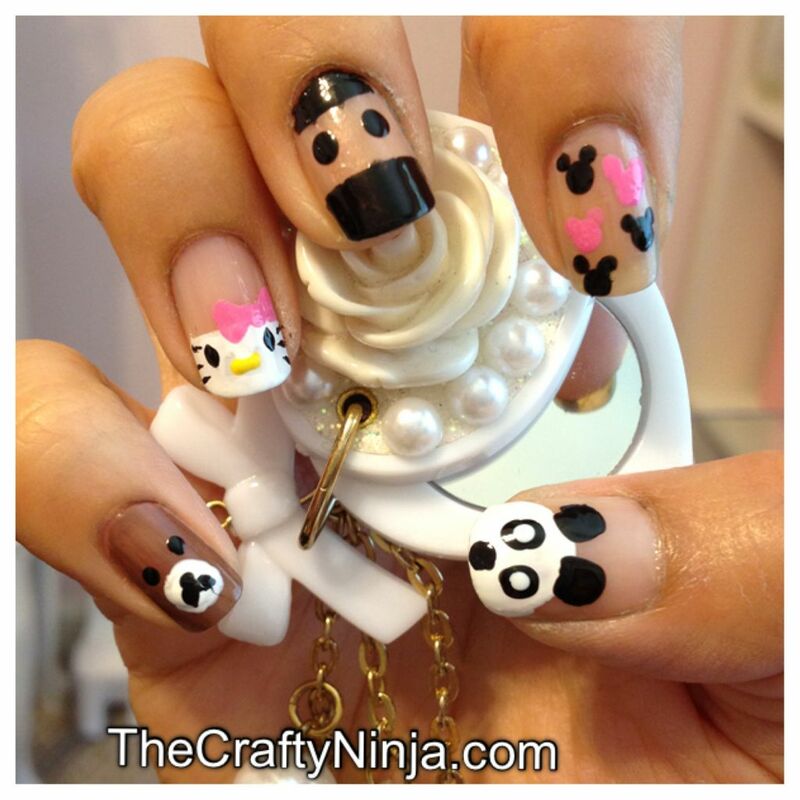 Today’s nail art is all about fun, cute, kawaii nails. 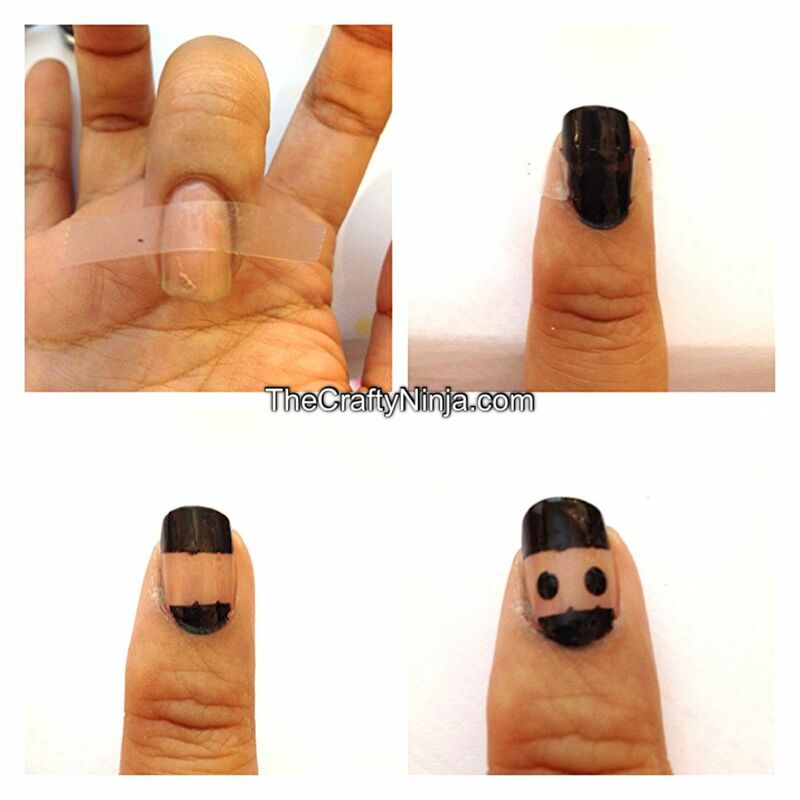 In this nail art tutorial you will learn how to make Panda, Mickey Mouse, Ninja, and Hello Kitty characters using the Nail Dotting Tool and Scotch tape. Supplies needed: Finger Paints Base Coat, Finger Paints Top Coat, Nail Dotting Tool, and Scotch tape. First I free handed and painted a half circle of the panda’s face with a white nail polish. Then free handed the ears by applying two dots with black nail polish. For the eyes and nose I used the Nail Dotting Tool, dip the dot tool into the nail polish and lightly touch your finger nails. Repeat with the eyes in white. This nail tutorial is very simple and so adorable. A Nail Dotting Tool has two sides, one has a bigger tip. With the side with a bigger tip apply the dots to the nail for the face. Next with the small tip add two ears. I went back and added some pink faces too. First painted my finger nails is a light beige for skin tone. Once the nail is completely dry I applied thin piece of Scotch tape. Painted over with a black nail polish. Carefully peel the tape off and using the nail dotting tool add two eyes. Hello Kitty nail tutorial click here. Rilakkuma is the Japanese word for bear and this is a cute and cuddly bear character. To create this nail art I first painted my nails with a brown nail polish, Essie Mink Muffs. Draw a white circle with the nail dot tool. Add two black dots for the eyes and nose. Draw two lines for the mouth in an upside down v-shape. Sorry no pictures I got tired after all the other characters I drew.